Sophomore slump? Yea, London's White Lies don't know the meaning of that! 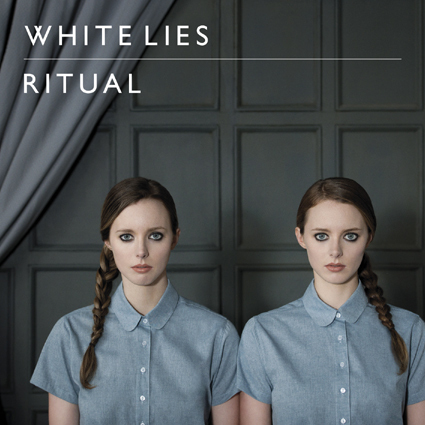 Their second album 'Ritual' was released this week and it is one huge, anthemic rock n' roll record. The kind that aren't made much anymore. They worked with Alan Moulder of Nine Inch Nails fame on this one and I think it was a good call. He was able to capture their sound and push the envelope. First single "Bigger Than Us" is a huge anthemic rock track that lead singer Harry McVeigh jokes in an interview has like 5 choruses. He might be right on that, but my favorite tracks on the album are tracks like "Peace & Quiet", "Come Down" & "Turn the Bells" were they bring it down a tad. Something about big rock bands when they tone it down that I love. Anyways these guys have a winner on their hands. Great record you guys should check out, especially if big rock and huge choruses are your thing. It doesn't get much bigger than this and I can't get enough of lead singer Harry McVeigh's voice, like none other in rock n' roll. Here's their video for first single "Bigger Than Us" which has almost 2 million views! Be sure to click the 720 or 1080 options for the better sound/video resolutions.